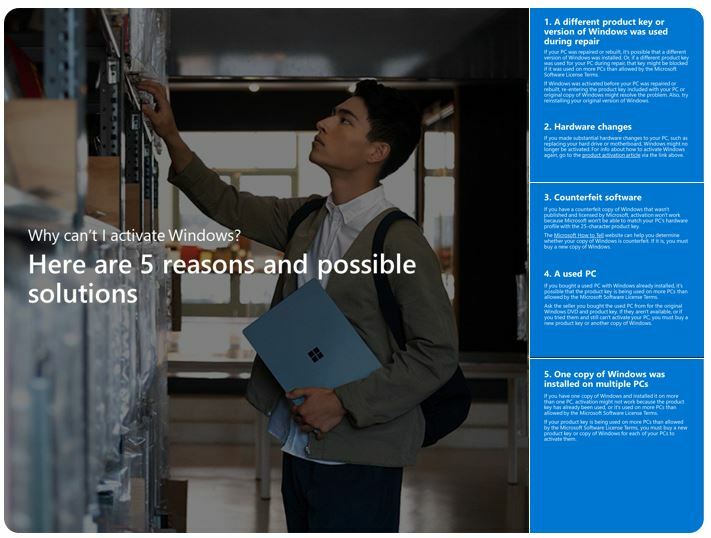 Today on Twitter, the @microsofthelps posted up a kindly and helpful post with five different reasons why a Windows user might get a notification that their Windows machine is not activated. They kindly point out the five reasons…. a different product key was used during repair, hardware changes, counterfeit software, or one copy of Windows installed on multiple PCs. I join with Woody and Ed Bott in saying enough is enough. Having the official @Microsofthelps twitter account make it seem like the activation problem is not their fault just makes me mad. Also it’s about near impossible to keep track of bugs in 1809 and where they are at in the phase of being fixed (obviously a key reason that we are nearly midway through November and 1809 hasn’t been unpaused). Enough is enough Microsoft, your customers deserve better than this. mindwarp 5 months, 1 week ago. If they want to present Win10 as SaaS to us — then they need to start acting like it. Elementary dear Dr. Watson!, Microsoft uses newfangled Artificial Intellect and statistics from Telemetry! or one copy of Windows installed on multiple PCs. Just love that Clause number 5, some one in Redmond’s reaching a bit deep in the old excuses bin there, So one created .ISO for “use on another Machine” is one of the reasons for none Activation or failing? Well that’s just plain nonsense to even suggest that would be the case, Normally when I use a downloaded .ISO created with the Windows Media Creation tool it’ll go on several Machines both at Home or at work. That’s what it says with the Media creation tool. Just plain silly to even suggest that you need to download a separate .ISO file for every Machine, why don’t they just come clean and confess they messed up, hey mistakes happen, Machines and Software break 100% reliability/availbility is nice but not always achievable. ISO was not mentioned; only re-using the same license key on multiple PCs. A company that can’t be trusted… can’t be trusted. That ties in with one of the reasons I think Microsoft is foolish to be doing what they’re doing with Windows (monetizing it in the short term, killing it off in the long term, as I see it). MS may see themselves as a cloud company now, but to the world outside of Redmond, they’re still the Windows company. As the fortunes of Windows go, so go the fortunes of Microsoft– in the minds of the general public, anyway. Bosses that select cloud-services vendors are members of the general public! If people perceive Windows as dying, they will tend to perceive MS as dying, even if stock prices are high and revenues have never been better. Look how many times we’ve seen people with above-average tech savvy write on this forum that MS is killing itself by killing Windows, even though Windows only represents a small percentage of their profits now. People perceive MS and Windows as being the same thing. On top of that, Windows is a natural on-ramp to the cloud services MS wants to sell. The irony is that this is exactly what they’re trying to exploit in the short term, but they’re trying to force it way too hard. Pushing so hard that you cause people to dig in their heels and vow to oppose you is not the way to go. It’s possible to have Windows and MS cloud services work well together, but without MS trying to cram them down Windows users’ throats. MS is trying so hard to monetize Windows (and that includes not doing proper testing– a penny saved is a penny earned, after all) that they’re making themselves look devious and evil. Do they think that the people who make decisions on which cloud service to use don’t pay attention to these things? Do they think that after they have finally killed off Windows, their cloud customers are just going to move on to another vendor’s OS and keep paying the company that cost them a fortune locking them into Windows, charging them a fortune for the “service,” then leaving them high and dry? Do they think that whomever comes in to replace Windows with something else won’t offer any cloud services of their own? Businesses are going to keep using technology, and while thin clients will be able to handle some of it, there are still lots things that are going to need real computers. Those computers are still going to need a real “does it all” OS. Kind of like what they are running now, and what they plan to keep running into the future. MS moves away from this at their peril. Even if they don’t make money on Windows itself, its importance in keeping their natural cloud customers (corporate customers) happy is such that it would still be worth it even if it was a net money loser. The consumer end, also, is important, in keeping the perception of MS as a vibrant and trustworthy company alive. Decision-makers at even the biggest corporations are still consumers when they go home and use computing devices in their daily life. They’re still subject to hearing what the media, friends, family members, and everyone else say about Windows (which means Microsoft, remember). If MS wants to sell cloud services, I think it would be well-advised to keep Windows alive and healthy, and that would mean stopping with just about all of this “WaaS” stuff. They know what customers want… it could not be more clear. It’s not this. They know how to deliver it… it’s not this way. They need to stop trying to monetize and bully the Windows users, and treat them again as customers rather than monopoly victims. Give them the OS they want, not the OS MS wants them to have. People have forgiven the Windows 10 pain train until now, chalking it up to growing pains as MS gets its “mojo” back and reinvents itself and the Windows development process. Given the growing number of complaints from former MS stalwarts, it would appear that the patience has run out. OK, and if and when it dies, years from now, it can always be sold for parts. And those most directly responsible will all have their golden parachutes ready, so what is the problem? I agree that the root of the problem is the abuse of a dominant market position, aka “monopoly.” Along the way it has corrupted an idea that I learned on my first job, which involved working in a hardware store when I was sixteen years old. There, I learned that it was important to listen carefully to what the customer was saying and quickly size up whether the thingamajig they said they wanted was the real answer. If not, politely suggest a real solution. There wasn’t a touch of arrogance about any of this; the core idea was to listen. Many customers were actually looking for help but a little embarrassed to say so. During my business career I saw the notion of what one author called “consultative selling” take hold. I promoted and encouraged that idea in my own people, to good result. More recently, however, it has begun to stink in the nostrils of mankind. Arrogant people in powerful companies insist on selling me stuff to meet needs I did not think I had. Their artificial intelligence tools make them [over-confident]. Their disinterest in actually listening to the customer suggests that their agenda is to meet their needs, not mine. This isn’t consultative selling; its hubris. A line has been crossed. If desktop users want an OS to serve their needs; they are told that Microsoft knows better than they what they need. I guess any good idea can be corrupted by such attitudes. Trust is earned everyday. Most will forgive screw ups if the vendor owns up them forthrightly; ‘bafflegab’ and blame do not count. Also, having been mildly burned by MS during the W10 initial release why would I want to get burned again? It wiser to keep my distance from MS’ cloudy products as how will they nail me this time is a valid question. This hurts MS long term not short term as I will not be recommending MS products to friends and relatives (I do not want to fix the resulting mess) including Windows; again more a long term hurt than short term. I have commented that MS will look good for sometime but then will be surprised when the market ‘suddenly’ shifts against them. It wont be sudden in reality but a slow building of users leaving that reaches a critical and very noticeable mass. Once that happens they will become IBM junior if they survive. The masses are restless with some already jumping ship and others waiting until the last minute to make a decision. Do they think that the people who make decisions on which cloud service to use don’t pay attention to these things? Do they think that after they have finally killed off Windows, their cloud customers are just going to move on to another vendor’s OS and keep paying the company that cost them a fortune locking them into Windows, charging them a fortune for the “service,” then leaving them high and dry? Do they think that whomever comes in to replace Windows with something else won’t offer any cloud services of their own? Businesses are going to keep using technology, and while thin clients will be able to handle some of it, there are still lots things that are going to need real computers. Those computers are still going to need a real “does it all” OS. Kind of like what they are running now, and what they plan to keep running into the future. MS moves away from this at their peril. Even if they don’t make money on Windows itself, its importance in keeping their natural cloud customers (corporate customers) happy is such that it would still be worth it even if it was a net money loser. The consumer end, also, is important, in keeping the perception of MS as a vibrant and trustworthy company alive. Decision-makers at even the biggest corporations are still consumers when they go home and use computing devices in their daily life. They’re still subject to hearing what the media, friends, family members, and everyone else say about Windows (which means Microsoft, remember). If MS wants to sell cloud services, I think it would be well-advised to keep Windows alive and healthy, and that would mean stopping with just about all of this “WaaS” stuff. They know what customers want… it could not be more clear. It’s not this. They know how to deliver it… it’s not this way. They need to stop trying to monetize and bully the Windows users, and treat them again as customers rather than monopoly victims. Give them the OS they want, not the OS MS wants them to have. Totally agree with this part, Ascaris. The thing is, people moving to other platforms have cloud services waiting for them. Chromebook users have Google Drive & Mac users have iCloud. Linux users have Dropbox & other 3rd party cloud services. Microsoft stabilizing Windows 10 (hopefully yearly updates & making those updates work the 1st time) will retain users… but it’s more important for Microsoft to regain trust with all users still on Windows. If I can be convinced that Windows will get better & stay that way for the long term, I will finally upgrade from Win8.1 to Win10 whatever & upgrade to Pro. MS has over 4 years for me, but slightly more than 1 year for Win7 users… & there are a Lot more of them than there are of Win8.1 users like me! Well. Microsoft’s Office 365 cloud offering is not actually all that hopeless even without Windows client systems. They could just switch to selling that for Mac and Linux users. What little of client functionality remains unimplemented there today, should be fairly minor to get fixed (except for MS Access, which apparently isn’t portable). BUT… I’m seeing what looks like similar issues with quality control and update management on 365 too, both the applications and the backend. Recommending Windows directly as an operating system for the desktop is something I haven’t been doing since… well, 1995? It’s always “What do you need to run on it and do you need to have it officially supported by a specific vendor?” which does depressingly often still end up meaning Windows. Server side… well, there was a long gap between HP AS/UX being discontinued and Samba becoming good enough. Of course the normal responses of “Your business is extremely important to us. … Please re-install Windows and see if this problem persists.” Canned responses from call centers around the globe. But no REAL human responses or caring. Hey, MS, your AI ain’t all that good! It won’t work. Start using another OS. Only that will teach them. Of course then you’d have a dependency on Google services instead of Microsoft. Google… hardly a paragon of stable feature sets and ethical behaviour! This is a company where employees literally just staged a massive walkout to protest internal company practices. Yikes. Between the two companies, you might as well stick with Microsoft — at least you can keep using old versions forever. I have Office 2016 for the Mac in my MacBook Pro laptop and, so far, have been using Word, Excel and PowerPoint without problems, although what I do with them is on the simpler side. I also have moved some PowerPoint and Word files from the Mac to my Windows 7 PC and vice versa, so far without problems. I use WINE extensively for old Windows (especially Win7) applications, but never for any Internet-facing activity. I strongly recommend it (it can be a bit of a pain to install, but worth it). Usually very slow to start the first Wine task after a cold boot, but thereafter (presumably when important components have been cached) I find that it’s quick, and (touch wood) reliable. There are occasional oddities: the File Open common dialog comes up as a very old-fashioned style, but it is certainly usable, for me. I have not tried using MS Office within Wine (I use Open Office within Wine, or at a pinch Libre Office directly in Linux). I installed Wine choosing “like Win7”, and I find that it actually can run (at least some) 16-bit applications, which Win7 doesn’t itself. So, Wine is even better than Win7 at running (some) old Windows applications. Linux Mint 18.3, Cinnamon, with Wine. Win7 is available on the same machine as a dual-boot option. In my personal life, I basically have. I’ve gone to Android, since at home I no longer have the energy to enjoy playing around and fiddling with a Windows PC, which was a joy for me, before 10. Now, after having to help people use 10 on staff and patron PCs, and deal with it myself, I only turn on my PC when I need to backup my phone or tablet nowadays, and no longer do anything serious at home. I keep up with 10 solely because I have to, not because I want to, and that’s sad, because I used to want and need to keep up. Thanks, Microsoft, for killing that desire. your customers deserve better than this. Um, aren’t we users the product, while the customers are the advertisers? How likely is that point 2 will ever become reality? Maybe more if that motherboard is changed and you used your own purchased key. If your mind works along certain lines, isn’t it simply wonderful that Satya is the Sanskrit word for truth… just saying…. …….back on topic the lack of self awareness at Microsoft is astounding at times. The disconnect between their self- perception and the real world opinion can surely never have been wider. M$ see’s themselves only as a legend in their own mind, that’s not how others perceive them. Thanks for the post – I couldn’t agree more. Really, do you expect MS to care or even listen? They seem intent on using AI as an excuse for pathetically poor (no) service as well as incompetence regarding updates. To some extent I can understand their push to AI as the current staff seem devoid of the real thing! The more they evolve the worse they become. I no longer have any trust what so ever, or believe in MS – at any level. I have used MS since DOS; never have they been so disconnected and oblivious to their loyal customers’ needs. Windows 10, Waas??? Joking of course. I’ve been an MS fan and user since the early ’80s when I bought an IBM PC and used the DOS command line. I’ve kept quite a few of those ‘ancient’ but fully operational PCs – mostly for fun and nostalgia: MSDOS, Win3.1, Win95, Win98, WinXP. My daily drivers now are Win7Pro with Linux dual boot. If MS keeps shooting itself in the foot, though, my feet will have already danced out of the room! Steve, I’m completely with you on that point. I started using MS operating systems in 1990, with the combination of MS-DOS 3.31 and Windows 3.0. I’ve used all of the versions on your list, plus ME (which came on the first laptop I ever owned, a Compaq Presario 1216us, before Compaq was HP) and 8.1 more recently. XP was overall my favorite, and I used that from 2002 to just a few years ago. Windows wasn’t perfect, but it was home, and it was better than the Mac fanatics were ever going to admit. Now I’ve mostly moved on. I’m using Linux now, as I do pretty much full-time. The only Windows use I see is in a VM, or else I’ll make use of the still-working dual boot setup to test or check something in Windows. I booted to Windows 10 on my Swift to run Macrium Reflect natively to image my Linux SSD (the Macrium rescue software does not support wifi, and my Swift has no ethernet card. I’ve got a USB3 to ethernet (gigabit) adapter on order, but I wanted a backup now, and using Windows was the quickest way. It’s Windows home, so when it was done imaging the SSD, it only gave me the options of “Update and Shut Down” or “Update and Restart.” I’ll take option 3, hold down the power button until it shuts down. You don’t get to call the shots on my PC, MS; I do. I’ve come to like Linux a lot, but I’m resentful of Microsoft for destroying something I used to like, even if it is their product. I’ve been using Windows for longer than Satya Nadella has been working for MS, and his rise to CEO has just been catastrophic for Windows. Windows 8 was born during the Ballmer era, and it was clearly a step in the wrong direction, but it was (as other versions of Windows have done) evolving to be better. The 8.1 update helped, and 8.2 (which had been announced in the tech sites before MS decided to go with 10 instead) was to be even better on the desktop. That version would have given us the Win 7 style start menu and Aero transparency effects, according to the article I read. That would have taken care of most of the major objections to 8.x! If only they’d gone that way instead of 10. Funny, the Marketers might call us “dinosaurs” to marginalize us – while introducing “new and improved Modern computing” that we have already seen, so far back as with things like the Commodore Pet. I prefer the term “wise with experience”, myself. Didn’t you always think that once the foundations got to be refined and solid, then we’d really start to see technology growth at the next level? Computers that actually help with work, rather than impede it! Flying cars! We spent a lifetime getting really good at something that’s now backsliding to the point where we don’t want to be in the same room with it. With no viable alternatives. Perhaps we should be happy it’s been this good for this long. Sigh. The arrogance of Micro$oft is actually what pisses me off the most. They push broken products time and time again, but don’t inform at all. I am quite sure that this behavior is even illegal in many countries. However, they have such a tight grip on the marker – including governmental institutes – that no one is willing to risk a huge conflict with them. A very worrying status quo in my opinion. And one that will end up in the history books as a text book example how software monopolists should never have been granted such power in the first place. We can discuss this issue until we’re blue in the face, but the situation for home users can be summed up in three words. Touché. Sums it up really. On the other hand: that’s what all Support Teams are doing these days, n’est-ce-pas? Pushing back an issue via First Line Support to the originator without even comprehending and/or considering the root cause (so Second Line / Devs can report that all is well). When that happens to me I usually see red (and might even become unpleasant). One would think that Microsoft’s high-powered AI and executive suite brain power could have addressed the situation more effectively than falling back on the perfidious strategy of “blaming the victim”. Susan, have you forgotten that any thing that MS makes is either not their fault or a new feature (files delete during update) and not a bug? MS will never admit to making a bug or mistake since they could be suit and lose money. MS has no respect for customers so do not hold your breath for MS to do or fix anything. We have fully investigated all reports of data loss, identified and fixed all known issues in the update, and conducted internal validation. Today [October 9, 2018], we also released some other fixes in the monthly update for customers who have already taken the Windows 10 October 2018 Update. More details are available in KB 4464330. AskWoody Site provides useful information in obtaining functional Windows operations and presents working solutions to problems. This site is a viable and accurate alternative to Microsoft information. They called it a new feature to remove old profiles on share workstations and did not acknowledged that it was a bug on their part. MS still working on it. On site note, since MS and Windows is going down the toilet, Bill Gates will be a plumber and pursuing the toilet of the future. Is it his way of trying to salvage or help rescue it as it goes down.?????? He should come back to MS and work on fixing the many issues that have arise since he step down form day to day activities. This is not the main bug. You have to badly misconfigure your machine to actually encounter the mentioned bug. Why would a home user automatically delete profiles, even after a number of days? Why not deleting in the normal way from Control Panel? I can understand that configuration on a server with too many administrator user profiles and C drive running out of space, but on a home system? The most annoying one, although this relates to user misconfiguration too, but far more understandable why it would happen, is when the user redirects their home (profile) special folders like Documents, Pictures, Music, Videos and do not move the contents. In such a configuration, the upgrade deleted the original, non-moved content. One may wonder why redirecting if not moving the contents, but this is a totally possible outcome even from users not intending to do so, but clicking on the wrong button. This is not the main bug. You have to badly misconfigure your machine to actually encounter the mentioned bug. Why would a home user automatically delete profiles, even after a number of days? Why not deleting in the normal way from Control Panel? Why not Settings (which is the normal Windows 10 method)? I can understand that configuration on a server with too many administrator user profiles and C drive running out of space, but on a home system? Why server? Why administrator? Much more useful for workstations with multiple short-term users (e.g. shift-workers like hospital doctors/nurses on mobile computers). Fixed more than a month ago for the three scenarios (on first installation of 1809) mentioned at #232378. If it was fix, they would have release to the public. Right now only the Insiders have it and those few that got update force able by MS. It still is not official fixed in my eyes until that happens and the feature–(bug)–does not happen again but it might show up again the way MS does thinks. That fix was released to the public, not just Insiders. It appears Microsoft is in their own little world now. The action Susan mentions seems criminal to me. I smell a class action lawsuit coming. In other Microsoft news, there are a few stories floating around stating that OEM vendors are angry because they have hardware ready to ship for the holiday season. The only problem is they have 1809 installed which does not yet have mainstream support. And for all you gamers out there it has been announced that Microsoft has bought Obsidian entertainment. The founding members of Obsidian originate from Interplay and Black Isle studios which created Baldur’s Gate, Planescape Torment among many others and Star Wars rpg Knights of the Old Republic under the Obsidian name. Obsidian will now be producing games for the Microsoft Store app. Remember all the good times we had with Windows Live! It’s a shame really to see such a legendary group head in this direction. The part that really angered me is the reply from the MS Twitter account to the very pointed reply that you highlighted, Susan, where the MS Twitter wanted to shunt any further discussion into private messages. Why? The issue was already publicly acknowledged and fixed by MS, so why hide any discussion of that problem, which was related to the topic of the post, to private messages – unless MS wanted people to forget it happened, of course. Unfortunately, the time to conveniently forget is long past, especially since MS just posted this relatively shortly after the activation server problems. There is zero chance that Microsoft will ever build into Windows a dashboard that keeps OS related problems awaiting fixes front and center where they can be seen and easily monitored. Out of sight, out of mind is the order of the day. With respect to being able to easily block updates from within Windows, MS is now too dependent on the data it collects to allow users the means of curtailing that update related data. Short of rehiring all the testers they let go, MS has no other viable alternative at this point. The take away, Home users are mostly being exploited and Pro users are next whenever MS feels they can get away with it. There is ton of common sense in Anonymous’s answer above. There should be an easily accessible web dashboard on the MS support site for known issues, and their resolution…in plain English. However, that would require a support staff to monitor and maintain that dashboard, not just read canned answers off of a script. I guess the shareholders wouldn’t like that. I’ve asked several times about telemetry (including Ed Bott, who blew me off). The question is this…Telemetry was supposed to be Microsoft’s way of anticipating issues with Windows (in theory), but so far has failed (in practice). Since Telemetry (if you go by what MS initially proposed it to be, a better way to avoid issues) has failed to anticipate or resolve Windows update issues, what other reason would Microsoft have to continue using it, vs going back to hiring competent testers? Having not visited in a very long time, I was disappointed when checking in a couple of days back. And now this. The sentiments expressed in this thread are largely mine, too. I want zero problems with my OS and don’t need infusions via what I’m (again) reading here. Like many, I go all the way back to DOS 1.x and Windows 1.03 … tinkering and tuning all the while. New stuff was almost always welcome and most highly anticipated. That includes the hardware, as well. How could we ever forget the intro of “Start”? Now it’s more like “hit it and hope”. It seems the Windows 10 experience/evolution isn’t going better now than soon after initial “release”. Maybe that’s wrong. I haven’t been following closely after making my choice to drop out of the newest OS pursuit. Ascaris’ and Noel’s posts above (responding to Steve S) express precisely why I decided Win 7 Ultimate was where I’d stop. So, I’m group “gone”: no updates, no telemetry, and no problems over the past couple years. Agree on XP being a favorite. Never had problems with stability and you could still get way under the hood. Loved (not as pretty as XP) Win 2000 64-bit. That thing was a rock. Hope everyone gets satisfaction (yeah, Stones again) and beyond the current spate of hassles. It really is ridiculous. So, it’s back to Win 7 and my dual-boot OS … Microsoft Bob. Patch Lady, you could also be called Patient Lady. It took you a long time to reach this point. I have had enough when they broke Windows Search and gave you either bad search or Cortana search (bad search number 2) and then removed bad search, and later added forced web search to bad search number 2. Sigh. I would have really liked to see the best Windows ever. I really thought it might turn out great at first, I wanted that to work. The insiders letters were inspiring. But then reality sats in with the disrespect for the consumer, the threats to privacy, the many useful features deprecated or the Pro features removed, the removal of ReFS from regular editions, the forced lock screen, dumbification of default beloved apps like the Windows Photo Viewer replaced by the awful non color managed Photos app, the default ads ridden OS, there was so many drops that made the glass spill over and over. It has been a long time I have had enough. I can’t recommend a Windows PC no more. I always ask do you really need a Windows PC? What are you doing with it?